Established in 1703, Joh. 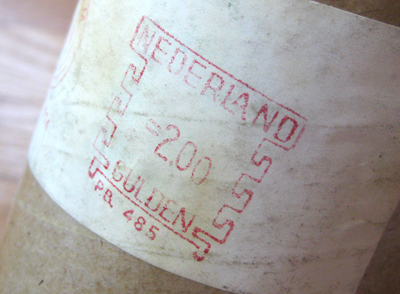 Enschedé en Zonen is one of the most renowned printers in the Netherlands. Some of the most well-respected names in typography are linked to Enschedé, including Johann Fleischman, Jan van Krimpen and Bram de Does. 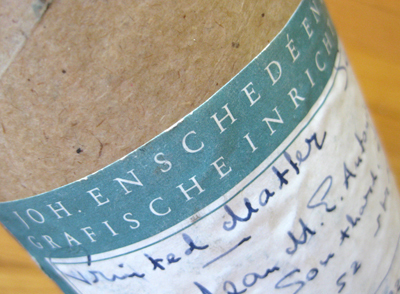 So, you can imagine my surprise when I discovered a mailing tube at the local flea market bearing a label from Enschedé. Although the container was empty, I did find a poster, presumably from the late 1950s or early 60s, advertising a textile exhibit in Utrecht, Holland—perhaps the missing contents. More to follow.